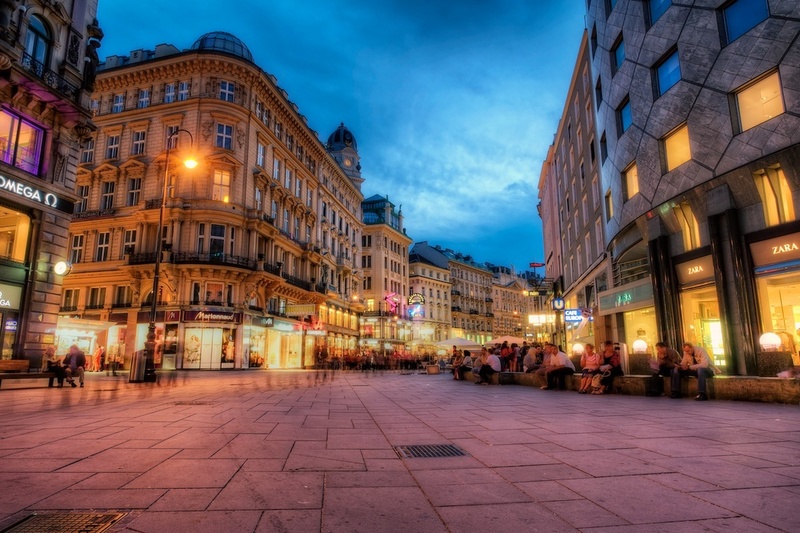 The Graben is a large pedestrian thoroughfare in the historic center of Vienna, Austria. As you can probably imagine (and as you can see in this photo), it gets very crowded around the dinner hour. I was only in Vienna for one night, so I made sure to get out and photograph the place as much as possible. I went out photo-walking as I made my way to find dinner. I strolled along, shooting this and that. I feel no hurry to eat when I find such lovely light and perfect subject matter. The light only lasts for a little while, and I can get food anytime. You see, I just love European streets, even when they are crowded. I thought the blue hour light was really beautiful, and I liked the shapes in the building, how they curve into the distance, and the criss-cross pattern on the ground. So, I just set up right in the middle of the crowd and fired away. I didn’t want to remove the person on the left that ghosted his way through the shot – I thought it fit the scene.